We are finally here at the father son showdown we have been waiting for. The real question is, is Jae-yi (Nakwon) still alive? I am leaving no as an option because this show has surprised me many times over. Though I do hope for a happy ending. Bring me my happy ending! We have to run to a meeting so we will be about 30-45 minutes later with our recap than usual. Check twitter for updates! Recap Countdown: Recapping! ….check twitter for updates! Dj gets to the dog farm and walk to the end to confront his father. HJ – You came, Namu. HJ – It’s been 12 years. HJ – I told you I would remove all the thigns that will make you pitiful and weak, I will remove themall, only strong survive. DJ grabs HJ by the colar adn holds up his hammer. DJ – Shut up, just tell me where Nakwon is. HJ – I killed her. I had to finish what I couldn’t finish 12 years ago. Your are my son, i will make you strong again. HJ pushes DJ against the cage. HJ – I waited for 12 years to finish this properly. DJ looks to his left at the chair, there is blood all over it. he looks back at his father in a controled rage. He pushes him away. HJ falls into the cage. HJ – Just finish it properly this time, I can die for you. DJ is about to kill his father, but he hears Nakwon’s voice. VO – I am okay Namu, I told you, I will never get hurt. DJ drops his hammer and looks at his father. DJ – No, you shuoldn’t have done it. if you really killed her you would want to show it to me. Because you want to see your son go crazy in front of you. Nakwon is alive. Where is she? HJ – Hit me. If you dont’ hit me, then Nakwon will die. Cut to nakwon asleep or passed out in another bright room. She is on the floor and her hands are tied. She wakes up and sees the blurry image of the nurse walking to her. JY – Namu is not you. Even though you talk that BS for 16 years, Namu didn’t become like that. HJ pulls JY’s hair but she chuckled. He tells he that it is easy to kill her, but he will kill her in front of Namu, that will be the biggest punishment. JY tells the nurse to release her. But the nurse tells her that they have to wait for Hee-jae to talk to his son, then you will be there. You should be punished for your wrong doings. JY – Punished? You and Hee-jae will get punished. Nurse – Hee-jae gave up everything for his son. JY – No, it is all lies because that autobiography is all lies. Nurse – Park Hee-young lied on TV, he told me. His son is so pitiful, that is why he turned himself in. JY – Park Hee-young died because she talked about the truth, about how weak HJ is. I saw it. He ran away after getting hit by his own son. It was cowardly. Yoon Hee-jae is just a weak and cowardly monster. You are that sme pathetic monster. Cut to HJ talking to DJ. HJ – You already did it when you were 16. You hit your own father with a hammer. The same way you hit me. Now you can do it better than that, isn’t it? DJ tells him to shut up. But HJ just continues, everything you want to protect should be destroyed. SJ, Umma, and HM are all in the hospital. SJ is veyr worried and thinks that something might happen to DJ. HM tries to comfort her and tells her not to worry. Umma is sitting on the bed too and remembers what she saw. She says that she should have stopped him back then, that is why she has this karma. I saw something at the dog farm, but I just ran away. The son became like this again. HM asks her what she is talking about. What about abogi? That man should not have been born. Don’t think about nonsense, okay? He thinks about touching her with his hand and holds his hand up to wipe her tears away. But he looks away after doing it. Meanwhile, MW is driving to the dog farm. Voice over that he also thought about protecting his house right? he revs his enginge and speeds down the road. HJ thinks that all those other things made DJ weak. You saw what happened to your brother and your mom, don’t you want to kill me? DJ stands face to face with HJ and remembers what Ajusshi told him before he died….that guy and you are different people…..don’t go the other way. Dj also thinks about his Umma defending him in front of all those protesters at his police academy. She told them that her son is not like that, she tells him that he is still standing even after all this high wind. He was named Namu (tree) because his mother didn’t want him to do anything and just stand and become an adult. JY told him that the hands he saves people with are so pretty. DJ throws the hammer away. DJ says, If I kill you then a lot of people will be hurt because of me. I will do things my way. I will finish you. HJ tells him that he will destroy everything in front of him, even though you deny it, we are a family. DJ asks, family?…..he thinks back to when he was 16. That’s right, me and hyung were your son and you were once human. But why do you give up being a human. Flashback – Why is this monster like you, my father? Why! DJ – You thought you would protect me like that, but because of you, hyung and me became monsters. Because of you, my life is destroyed. Dj thinks back to his interview for police school. DJ – I became a police officer to repay your sins. I want to just charge on people like you and I got hurt and was in pain, but i couldnt’ even scream. i just endured everything. In front of people suffering a lot more than me, I couldnt dare cry. People asking me what I did wrong, also hurt. Thinking about it was also sinful because I am your son. I am your son so i have to live this difficult day to day life in order to live for those people that you killed. It was really painful, I wanted to die. I didn’t do anything wrong, but you made me like that. You made me weak and pitiful. Not anyone else – you. So you are wrong, I am the evidence. HJ – No, no, the world is like that. People fear and respect who created fear. They talk bad about it and yell at it, but in the end, they surrender to it. That is why I am telling you that this world is a big cage. DJ – So you were afraid of me? that night you were already hit by me and want to control me but you cant do it. That is your fear. Whatever you say, you are just trash that got kicked out of the world. In another room, the nurse tells JY that they are not monsters, their surroundings made them that way. If they don’t become strong, the no one will take care of us. They will just ignore us and no one will remember me. That is why I did it. JY tells her that she is even more pitiful that way. You two will be forgotten as monsters because you are not even human anymore. The nurse stands and says that Hj will be next to her. But JY tells her that HJ already betrayed her. If you were important to him then he would never ask you to do these kinds of things. She takes this in and goes to her purse to get a syringe, she pulls something (some liquid) into it and walks back in front of JY. Back in the dog farm, HJ tells DJ that he still makes him excited. DJ asks him what that strength is that he is looking for, to just kill everyone and remove everything? That is not strength, that is weakness> Youa re timid and afraid, that is why you want to remove it first. That is why you hit all the weak people who were happy and living in the world with their own feet. HJ attackes DJ but he dodges it. DJ – I thought I was the same monster as you, but after facing you, I realize it. Even if I swing the hammer as you and have your blood, you are not my father. You are just a weak murderer. HJ attackes again and tries to hit DJ, but DJ is able to avoid it and push HJ against the cage. HJ – If I don’t go to Nakwon now, then that nurse will kill her. DJ backs up just enough for HJ to hit him in the head, he passes out. In the back room, the nurse is about to injet JY, but she is able to fight her off and ends up injecting the nurse with it! They talked about how the nurse does not know real pain. Outside, the police are all over the area. They are taking directions from MW. But then they hear that JY called. MW says there is no time to talk about it, lets go! Inside, Dj is on the floor. HJ tells him that he told him that he does not need a weak son, sostand up and hold this. HOLD IT! He holds the hammer out to him. But DJ will not take it, he tells him that he will never be like him. HJ tells him that he will have to break him piece by piece. JY runs up to the building and yells for DJ. DJ yells for her to run away, but seh goes up to him to protect him and tells HJ that she called the polcie. This time it won’t take 10 minutes. She moves to protect D from the hammer, but DJ swings her around and gets hit by it, hard. He gets hit another time and jumps into his father. They start to fight. DJ is able to break his fathers arm or do something to it which makes the hammer fall out. They both grab each other by the neck as they fight. But then the cops come in and tells them both not to move. DJ and HJ slowly remove their hands from each other. DJ locks HJ against the cage. DJ – Yoon Hee-jae, I am arresting you for kidnapping and two murders, you can have a lawyer and you have the right to remain silent. he slowly walks away past MW and pulls JY with him. They walk away together. Montage of the two of them walking together when they were kids. HJ looks at them walk away and resigns to his failure. MW – yoon Hee-jae, you are completley done. I want to kill you but i want you to experience the hell that I experienced as well. DJ and JY walk away from the dog farm building, it is night now. They look at each other. Flashback to NW hugging NM when they were kids. She cries and tells him to stay alive. Please stay alive in whatever way you can. It is not your fault. So don’t die. Never! If you die, then I am not going to forgive you. So promise me. You will survive. In the present, they just look at each other with all these things going through their heads and hug. YJ and JH are happy to see it, but also want to give them some privacy. MW walks out and looks happy to see it as well. 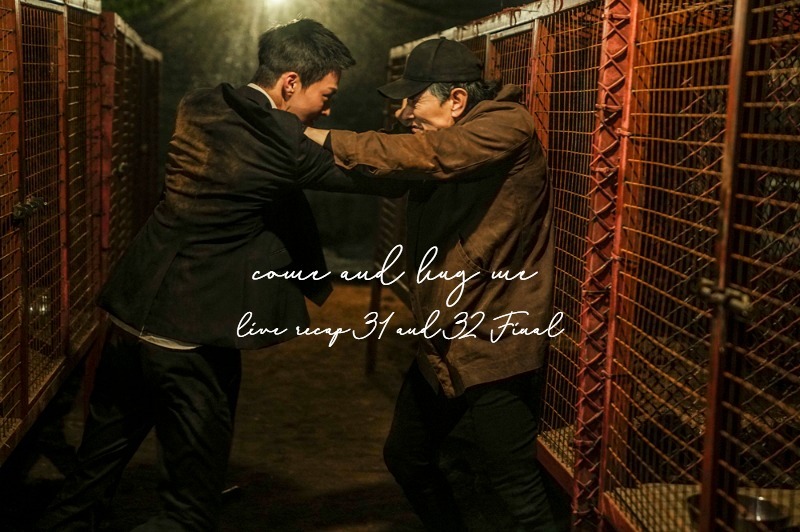 Inside, the bad cop is about to arrest HJ, but he pulls him around and takes his gun. then he puts it to the bad cops head quickly. HJ walks out with his gun to the bad cops head. DJ sees this and takes the gun from the cop next to him He points it as his father. They look at each other, DJ guages the range. Someone says Namu’s name. DJ moves the gun down and shoots HJ in the leg, it hits him right in the knee and he falls immediately. then he turns back to JY. JY slowly grabs the gun hand of DJ’s. Vo – That evil finally destroyed himself. We open this part on a bright happy scene quit similar to HM’s fantasy about what his life should have been. OH sets the table and tells her daughter that it is breakfast time! She happily goes to her room and sees her sleeping. DJ is at JY’s house. He sees a book about studying for a high school diploma and smiles. then he goes into her bedroom. She looks like she fell asleep while memorizing her drama lines. Dj happily goes to her and sits next to her. She wakes up to his happy face. DJ – How was your sleep. JY – Ah, it is real Namu. I feel like I heard your voice and fell asleep. DJ – Before I go to work, I want to see you. JY – I can’t fall asleep because you are not on the couch. Oppa is so busy and is not coming to see me. DJ – Do youwant me to move in again. JY – I am also bored, I want to play and see you. i want to kiss you. She quickly pecks him. he smiles and then pecks her back. they hug happily. DJ – Ah…I don’t want to go to work. DJ is walking in the hall with HJH. HJH – I met JY, she was energetic and bright. Well, maybe her heart is like that. I want to write about you guys. the unbelievable story for 12 years. I want to tell that story to other people also. Lets see each other smiling. You are the only one not treating me well. DJ – It is hot outside, be careful. The bad cop walks up and asks her what she is doing over there. She asks him why he did those things. You said he is the son of a murderer, but now you are on his side? Are you a hypocrite? he says that he is a son of a murderer, but he also put him in jail, so that is all done. HJH asks him if it is atonement because the team leader died? the cop says it was not on purpose. Flshback to him hearing the recording on the pen. In the present, he tells her that there was too much to consider in the world. Like him, if I shoot my own father then it is atonement, what about you, will you be like HY? She says she is choosing these things on her own will. He is all like, okay, okay. He walks away and is annoyed by another reporter who said he heard a fight. The bad cops swats him away like a bug, go away! JY is acting as a polcie officer on the set of a TV show. She is the polcie officer and tells the guy that as soon as she graduates she is on duty. So give me the hidden camera you used in the bathroom, do you think you are spider man? He says he does not have it, so she twists his arm around. CUT. Everyone goes back to normal as JY goes to the side to drink. PT thinks JY’s arm is all hurt, how many times does he want her to do this scene! JY says it is okay. Then he asks if he is okay. He says he has hard bones so he heals fast. JY laughs, you always say you are okay. PT says he used to be a thug, so he knows. Without MW, he waould have broken bones all the time. He starts talking about how he became a manager. 7 years ago he met MW and quit being a thug and started being a manager. He is thankful. JY tells him that they are also thankful. Later on JY takes photos with her fans. The fans still kind of talk about Han Hee-jae and whisper about it, but it does not bother JY. She walks away to greet PT who is on the side. MW is working hard at work. YJ comes in to see him and asks him why he is not issuing a search warrant for someone. MW says that he thought the investigation was not enough. She tells him that it is enough. He tells her that he will decide it. She says that his decision is wrong. He tells her that he has an urgent issue and will ahve to talk about it another time. But she just goes after him and asks him if he always works this slow? What is more urgent than this? there will be other victims as he spends his time thinking about it. Process this first. His people laugh in the background. MW cooks for JY, he tells her that he is sorry that he was late, but he wanted to make her a good dinner. She tells him to stop worrying and caring about her so much, care about yourself first. He tells her okay. he also tells her that the will not talk about her love life anymore either. She can break up or date, he will jsut watch her next to her. Let’s eat. They both smile and start eating. OH and DJ eat together in a bright home. he says he will see Nakwon after his brothers trial. OH asks him if he is happy. he says he is. She tells him that it is good if he likes it. Just enjoy things that are happy. When things become hard, remember that you can be happy again, okay? DJ smiles and happily eats his food. DJ gets a special award and promotion at the station. he is presented it in front of his team. Everyone claps. The plack says that he is a Super Intendent or Inspector now (something like that). DJ looks at his award later and is congratulatied by his team. thebad cop congratulates him warmly as well. They all tell him that he is cool. DJ smiles but his smile kind of falls when they walk away. The brother walks up the hallway at jail. The father walks down the hallway, limping. HM ignores him and keeps walking. he goes to his trial. OH and SJ are in the audience. HM sees them and goes to sit in his seat. The victims family comes in as well and sits in their seats. OH and SJ bow to them. HM watches them doing this and looks like he finally understands the weight he gives to his family. DJ also shows up in his police unifrom and nods to HM. The prosecutor on this case is MW. He reads all the crimes. There are 4 crimes that are cruel crimes. He was also on a conditional release period. They have to take that into condition even though he accepted his crimes. In another proceeding, the copycat, HJ, and the nurse are all in court together. The CopyCat thinks that HJ is weak for getting hit by a child, he should have just hit him with his hammer! The nurse also tells him that he said he would protect her, but he said that it was all her idea! You psychopath! Both of themhave to be removed from court. HJ leaves court later to an onslaut of eggs and screams. DJ is watching from a distance with OH and SJ by his side. then DJ tells them, let’s go, and they walk away. The reporter is sitting at her desk listening to her team and interviewee’s. It looks like she is interviewing the victims families. She warmly greets them all. At home, JY sees the news which says that the CopyCat and Nurse made a big disturbance at the jail, so the trial is delayed. JY goes to the news and looks at it for a moment, but she turns the channel. the next channel talk about her mother, Hae-won’s, grave. A lot of peole remembered her and came to her gravesite. Her last works still goes on. JY gets teary eyed, but turns off the TV. She runs to the front where DJ just showed up and hugs him. They happily smile at each other. Later on, DJ fixes a cabinet and looks at JY’s parents photos that rest on top of it. JY is in the back looking at her parents photo as well. She is crying as she looks at them while sitting on the floor. Dj goes into the room and kneels next to her. JY – Namu….I want to see Umma. Especially today, I want to see them so much. I didnt’ want to cry because you are here. I’m sorry. DJ just sits next to her and softly looks at her. DJ – Just cry, don’t hold it back. Jy – I cry all the time by myslef, it is kind of weird. DJ – Now you can cry only in front of me. DOn’t cry alone. I waited for you to cry. JY – If you see me crying becuse of Mom and Appa, I thought it would hurt your heart. He kisses her softly on her forehead. Dj – I love you Nakwon…..I love you. She starts sobbing on his shoulder. VO – 12 years ago, the wall between our relationship that we could never destroy or conquor, that strong wall that looked like it could never be destroyed. 12 years later, because of us, it is totally and completely detroyed. HJ is in his jail cell looking destroyed. VO – the time of that bad evil, will never run again. DJ happily cooks in the kitchen. JY comes up and hugs him so he laugh and gives her a little bit of the food he is cooking. She tries it and says that it is really good. They go behind the house, DJ thinks that she had this kind of cool place behind her house, that is cool. then they start to play with water outside. they go back inside, he tells her that she will get cold (they are both drenched). He has a little flashback to when they were kids and happy. She tells him that she loves him and they kiss lovingly. Then they smile and hug. After their hug they also look happily at each other and laugh as she pushes him playfully onto the couch. They kiss even more on the couch and wind up asleep in her bed. She turns around and cuddles with him. he also puts his arm around her as they both continue to sleep. HJH writes something at work. The title is: It is Not an Illfated Relationship, it is Salvation – The Son of the Murderer and the Daughter of the Victim. She looks at her work for a moment. VO – the word remembers them as the murderers son and victims daughter, but they are not an illfated relationship, they are the salvation of each other. In the prison, HJ looks at the magazine article that HJH wrote. Someone mailed it to him so he just looks at it looking miserable and broken. Elsewhere, DJ walks outside and walks into young Namu. JY – 12 years ago, after experiencing that hellish night. Dj – My Namu (tree) did not grow anymore. JY – The Namu that never grows anymore, maybe was waiting for…. DJ – Come here, I will hug you. Namu walks to DJ for a hug. He stops right in front of him. DJ – The sun and rain that will make him grow again. DJ walks the rest of the way and hugs Namu. DJ – And someones warm approach. JY – Come here, I will hug you. NW walks to JY, JY gives her a very warm hug. JY – as soon as I was touched by that warm hand…. JY walks around the park and sees DJ happily standing byt the water. they hug and walks off hand in hand together. DJ – The tree that stopped growing, now grows super fast. They happily walk around and joke outside at the park. JY – Everywhere the leaves touched…. DJ – Became Nakwon (heaven)…. Oh my goodness, this show was so great. How did MBC make this kind of show after The Great Seducer?!? I had thrown away this station as not producing anything worth watching, but then this show, that had the hardest time finding actors, came along and completely flipped me around. I really enjoyed Come and Hug Me. I loved this final episode. Even though this is a show about serial killers and evil, I feel all warm and happy inside. That is the mark of a wonderful writer. I also really enjoyed the cinematography and music. The music especially was wonderful and did not distract from the emotions that the scene was giving out but added to them wonderfully. I will be keeping my eyes open for the writer, director, and actors in the future. I hope they have several offers coming their way. Keep refreshing the page hehehe thankyou anyway for recap until the end. Fighting! Awww it was worth it, I love this drama, full of angst but at the end the good prevail! I was hoping for a happy ending and they delivered, thank you for your recaps! I would have wanted a little more of Hyun-moo but it was a good ending. When I saw the first two episodes of Come and Hug Me, I knew that I loved this show and that it would speak to me personally, especially because of the pain that was caused in a family by one evil person. But I could not watch, absolutely could Not watch, this wonderful show until I knew what would happen at the end. So I have been avidly reading your great recaps as a “safe” way to enjoy the story, and now I look forward to being able to binge-watch my way through the whole show this weekend. It will be both new and familiar, and I won’t have to worry about the “what ifs” that can go so wrong with the endings of some Korean shows (which have broken my heart all too often). We never know how we may help another person unless they tell us so, that’s why I want to say again: Thank you. This is a door that would have been sadly closed to me, and you opened it by recapping. I am the same, sometimes I cannot watch a show that might have a bad ending until I figure out if it is a happy ending or not. I was that way with Stranger Things, I had to have O spoil me on the ending, before I started watching it, in order to see if I would invest time in watching it. So happy we could help you out and I hope you enjoy your binge watch! I really enjoyed watching this drama. The closure to the story was done really well. It was beautiful and satisfying. The acting was great. Kudos to the actors (Jang Kiyong and Jin Kijoo) for doing such a great job. I can’t believe this is only their first lead roles. I mean this is definitely not an easy role to act but they were able to portray the emotions really well. I am impressed! I hope to see more of them as leading actor and actress in other projects going forward. Thanks for recapping this drama. I completely agree. I loved both leads so I wish lots of success for them in the future. I kind of feel like Jin KiJoo might be suited for a very cute role because she seems so adorable. For Jang Ki-young, I am not sure what role will best suit him, he has shown a range of diverse acting abilities, but I selfishly want him to do a romantic comedy next. Oh my gawd! I’m bawling my eyes out. Thanks for the recap, V. I think I’m going to binge-watch this. I have to! Thank you for recapping! It was a beautiful healing drama like my ahjussi. Hope to see more of Jang Ki Yong leading dramas in the future. I`m glad that after all what they went through, they overcame it and lived HEA. ^_^ It was definitely great knowing that Na Moo and Na Won will be walking on the flower path now. I also liked the part where it talked about that the ones who had to continue living the nightmares of the victims try to find ways to be happy. It will be a forever nightmare for them, but at least, they’re moving on and try to find happiness. And Hyun Moo <33333 definitely had the best character development in the drama, I love Na Moo and Nak Won, but Hyun Moo stole me. V do you know if the full soundtrack for Come & Hug Me will be released? I want that poignant music that’s everywhere for 20+ episodes! I found a piano cover but that’s about it. I would think so, they have been pretty good at providing a lot of information. I’ll keep my eye out for it! We are picking up My ID is Gangnam Beauty! I actually have not heard of The Call Project. Can you send me a link to it?